Two weeks of conflict made crossing borders too difficult to arrange in time. They may have had a chance if they had gotten out. Rami Nabaheen approached us because he was looking for help. He was at a loss. Four days earlier his wife, Najwa, had given birth to conjoined twins. They are attached at the chest and abdomen and share a heart and a liver. The one heart cannot beat for two and they must undergo separation surgery so that one of them may survive. 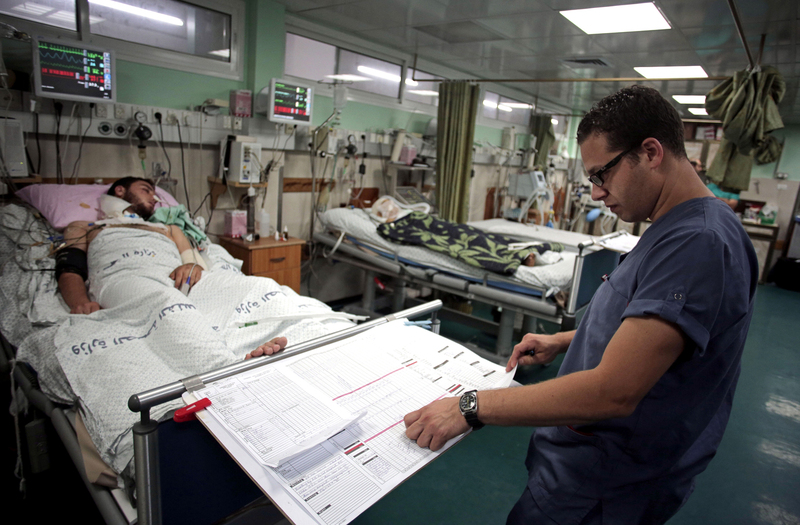 The procedure is complex and beyond the capabilities of Gaza’s Shifa hospital, they need to be transferred to a medical facility abroad. We are standing in the open courtyard of Shifa when he and his 60-year-old mother, Amna, walk up to us to tell us their story. The twins were born on July 20, the bloodiest day of Israel’s assault on Gaza that has left nearly 700 Palestinians dead, the vast majority of them civilians, including over 160 children. Rami, a 36-year-old resident of al-Nusairat refugee camp in central Gaza, has spent the past three days trying to finish the required paperwork to get his newborn twins across the border into Israel. Every day counts. With only one heart between them, they are struggling for oxygen. In the chaos of the conflict, Rami cannot obtain the necessary permit from the Palestinian Authority. Their office doors are shut amid Israel’s incessant bombardment of the Strip. Even with the proper documents, the route to the Erez crossing in the north is fraught with danger and there no is no guarantee the border will be open. He is getting increasingly desperate. Rami and his wife have five girls. The newborn twins are boys. His youngest daughter wants to name one of them Kareem and the other Ahmed. Rami and his mother ask us to come see the twins in the neonatal ward. We walk with them. We pass the morgue where dozens of people are waiting to collect the newly dead. We enter the neonatal ward and see the doctor standing in the hallway. When we explain that we are journalists coming to see Rami’s newborns, he looks down at the floor and then up again. “You are too late,” he says in English. I assume he is talking about visiting hours and ask him what he means. He speaks slowly, in English again. “They died two hours ago.” Cardiopulmonary arrest is the cause. There was too much stress on the heart they shared. The father and grandmother do not understand what he is saying. They are looking at us with a questioning, worried hope. I try to hide my grief. The doctor tells them the director of the neonatal ward he would like to speak with them. We all take a seat around a table in his office. The director, Dr. Alam Abu Hamda, is sitting behind a desk. There is a moment of awful silence. “They died?” Amna asks. Rami has not said anything. He looks away from the doctor and into the mid-distance. He blinks and nods a lot. There are tears forming in his eyes. He looks back at the doctor and says, “Both?” When he asks the question, his voice cracks, his face contorts and the tears leave his eyes and roll down his cheeks. The doctor tries to soften the blow. He says the surviving boy would have had a very difficult life, that they are both with God now. Rami is silent in his sorrow. The twins’ condition was perilous from the start, but they did not have to die. Many different factors contributed to their death. Two weeks of a conflict that has only been escalating made crossing borders too difficult to arrange in time. They may have had a chance if they had gotten out. But it wasn’t only the war. In densely populated Gaza, Shifa hospital is overwhelmed with up to 17,000 deliveries per year, according to Dr. Abu Hamda. There are not enough specialists because the few doctors on hand have to be general practitioners to cover all types of cases. They do not have the proper expertise in congenital diagnosis. Whoever did the ultrasound couldn’t tell the twins were conjoined, doctors only found out during the caesarean delivery. The conflict has only made things worse, with patients displaced from other parts of Gaza streaming into Shifa and placing a huge burden on medical staff. There are only sixteen incubators in the intensive care unit of the neonatal ward. Equipment is in need of repair and there are frequent power cuts due in large part to the seven-year siege of Gaza by Israel and Egypt. None of this matters to Rami who, like so many thousands of Palestinians in Gaza, must now mourn. His newborn twins spent their brief lives facing each other. He will bury them still attached. Rami says he will wait until he gets home to tell Najwa. “She will be sad, but she is stronger than me,” he says. He is concerned that she cannot get pregnant again after the C-section. The doctor assures him she was not affected.